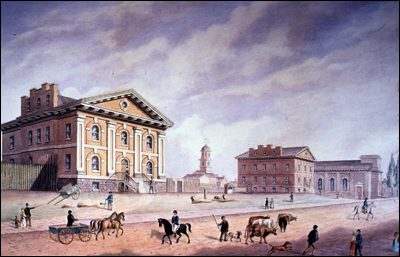 In celebration of the 175th anniversary of the City of Toronto in 2009, the Archives and Museums & Heritage Services created this exhibit exploring what the capital of Upper Canada was like in 1834. 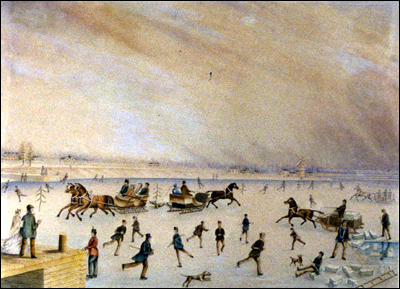 Oil on canvas, 121.5 x 304.5 cm. 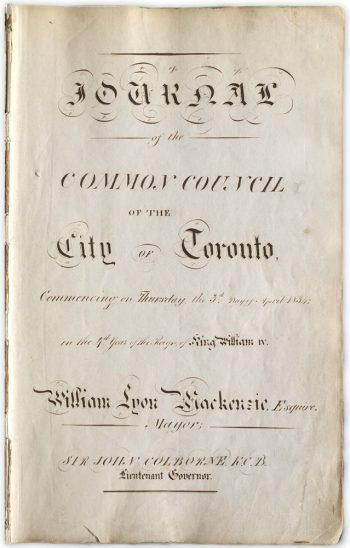 On April 22, 1834, Council agreed to petition His Excellency Sir John Colborne, Lieutenant Governor, to arrange to have a plan drawn up of the new City of Toronto, its liberties, and its harbour, showing its division into wards and the relative connection of its limits with adjacent township lands. Samuel Proudfoot Hurd, Surveyor General, was duly placed in charge of the request, and James Grant Chewett of his office was assigned the actual task of preparing the plan. The completed plan, dated June 24, 1834, was presented to Council July 3, 1834. The plan above is a copy of the original prepared by Wadsworth & Unwin, Provincial Land Surveyors, and dated April 1, 1871. 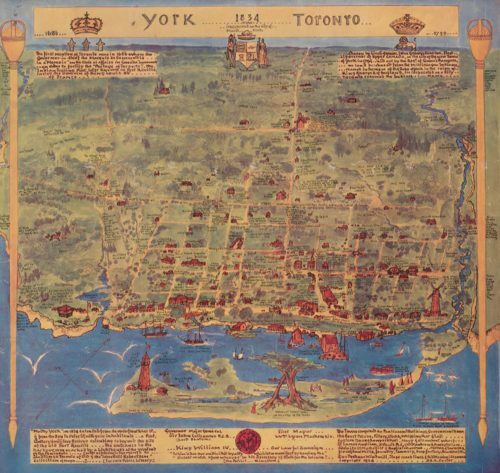 The Act of Incorporation extended boundaries of the old Town of York to Bathurst Street in the west, Parliament in the east, a line 400 yards north of Queen Street in the north and the lake in the south. 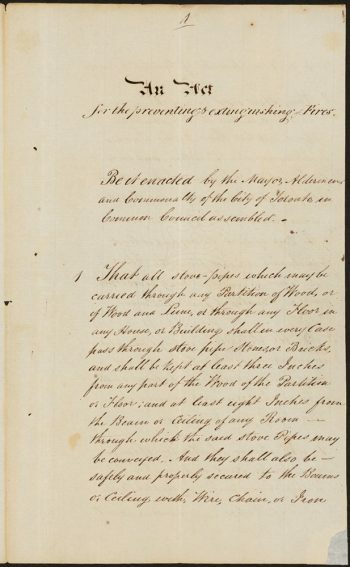 Toronto’s first by-law, described as “an Act for the preventing & extinguishing of Fires”, was passed on May 10, 1834. Intended to reduce the risk of fire in a city largely constructed of wood, the by-law specified building requirements, regulated or prohibited hazardous activities such as the disposal of combustible materials, and defined the responsibilities of fire inspectors and wardens, fire companies, and citizens in preventing and fighting fires. The Journals of the Common Council provide the fullest record of the activities of Council for the year 1834. Likely compiled by the Deputy Clerk, the journals contain not only a copy of the Council minutes, but also the text of nearly every committee report presented to Council. The large handsome brick buildings, now nearly completed, immediately opposite the lake, reflect the greatest credit on those engaged in their erection. 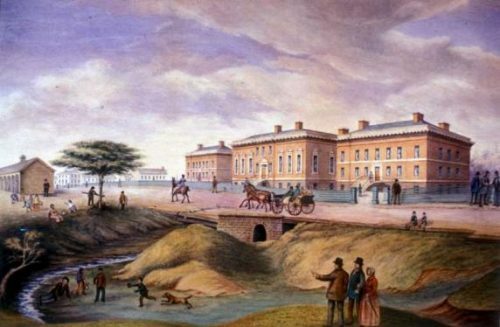 These buildings are intended for the sittings of the Houses of Assembly, and the legislative body; and also for the occupation of some of the public offices. In the cells below the ground floor, your committee found three female lunatics confined…in such a noisome place, will be likely to aggravate the disorder…were they taken to a particular ward in the Hospital, and the usual restraints put upon their persons, (of strait waistcoats,) and gently treated, might either wholly recover their reason, or at least become convalescent.